You might not want to check this out for yourself, but do you know how long it would take for a person to fall through the Earth? Around 42 minutes. That’s according to MinutePhysics, which uploaded a video to YouTube in response to a recent collaboration between the science channel and Vsauce on the effects of a hollow Earth. 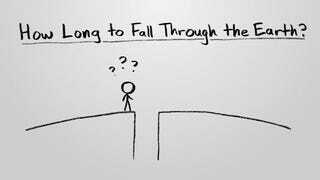 Basically, the physics behind this fall is similar to that of a moving pendulum. As you fall, the mass beneath you decreases as the average gravitational pull on you from that mass increases. But the mass decreases more quickly, so as you approach the center of the Earth, you start going faster and faster but the force pulling you towards the center also decreases. (For simplicity’s sake, the hole goes from the North Pole to the South Pole. Also there’s no air inside the hole so you don’t reach terminal velocity). For the full math behind the theory, watch below.